Oh look. What a surprise. I'm reviewing more cleansers. And I have another post next week reviewing more. But they are my favorite skincare product and I love that you can see results almost instantly. From a price standpoint, they tend to be the best entrance into a new skincare brand without having to go for a full commitment like a serum or moisturizer. 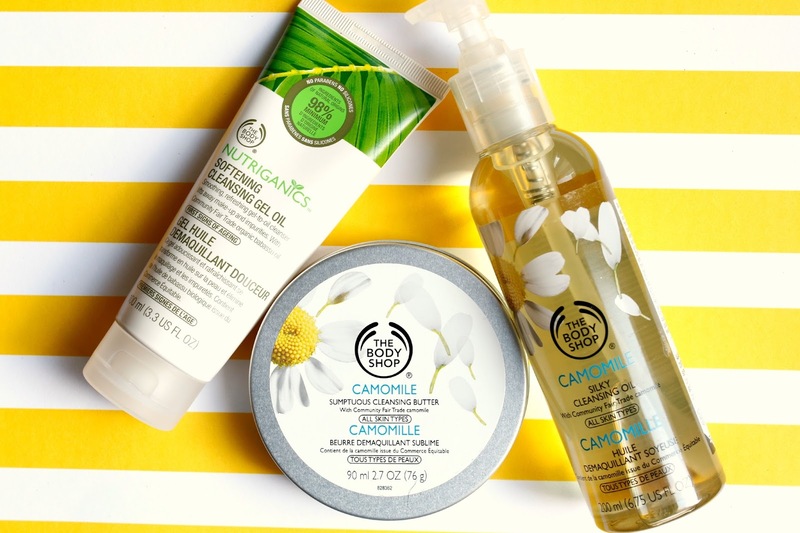 It's like dipping your toes in the proverbial skincare pool. Or something like that. You get my drift. Onto today's post.....I have heard rave reviews about The Body Shop cleansers so I finally had to see what the fuss was all about. 1. 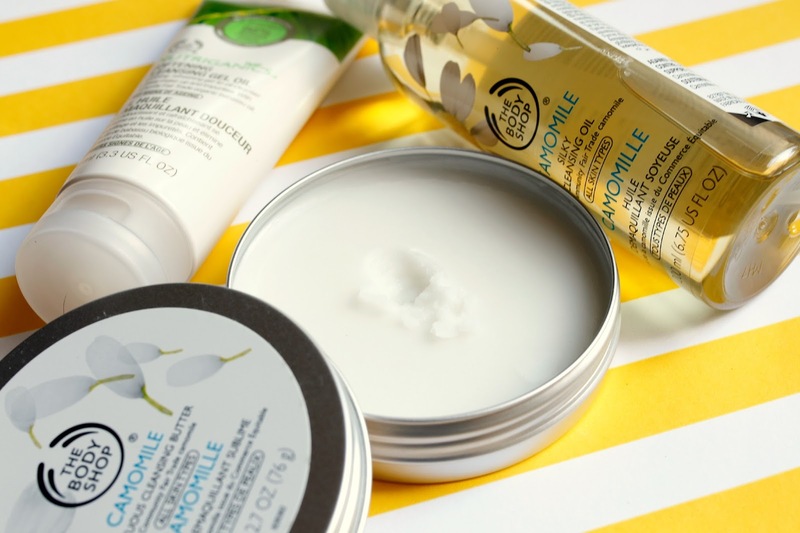 Camomile Cleansing Butter - When I first posted a picture of these cleansers, this Cleansing Butter seemed to get some mixed reviews. I have to admit that when I first touched it, I thought it would be too hard to really enjoy as a cleansing balm. Boy was I wrong. As you can see from my little fingerprint above, the product does have some stiffness but as soon as you warm it up into your hands, it melts into a workable thick balm that removes makeup effortlessly. Like almost at a record rate. I was tempted to time myself because my face was clean so fast. In fact, if I had to rank all three, I would make this my #1. 2. Nutriganics Softening Cleansing Gel Oil (swatch above) - An absolute fantastic second cleanse option. I didn't find that this takes off makeup as well as the cleansing butter or oil, but as a morning cleanse or second cleanse it feels amazing on the skin. I figured with "gel" in the name this would have more slip to it but surprisingly it feels much like a lightweight balm, which then breaks down to an oil and finally a milk when emulsified with water. It is perfect for working into the skin and really giving the face a thorough massage. My skin was left feeling soft, hydrated and smooth. And for the price point (currently on sale for $7.25!, see here), this is a STEAL. Buy two if you must. I won't judge. 3. Camomile Silky Cleansing Oil - This cleansing oil is as thin as they come and feels incredibly lightweight on the skin. For those of you hesitant to try a cleansing oil because of the fear that it will feel thick and well...oily, this is a great option. It glides over the face, has a water-like texture (but it's still oil so there is some slip) and removed even my stubbornest mascara. Add a touch of water and it emulsifies into a hydrating milk and leaves your skin feeling soft without any remnants or residue. I have and looove the cleansing butter, both an amazing cleanser and makeup remover! I really want to try the oil. I haven't even heard of the Nutriganics line but that cleanser sounds so lovely!